These reusable food wraps fit containers of all sizes and shapes, or even cut food itself. Don't bother putting those leftovers in a plastic container, then locating the lid (if you can), and maybe subjecting yourself to infomercial-style frustration. These super-stretchy CoverBlubber® food-saving wraps are a safer alternative to plastic wrap (BPA and Phthalates-free), and fit tightly on various sizes and shaped containers, or directly on fresh-cut food like tomatoes and lemons. They're made of food-safe StickyRubber™ that’s made for use in the refrigerator or freezer (but not for the dishwasher or microwave). The set of four colorful wraps will accommodate most containers and foods and help head-off meal remainder meltdowns. Made in China. Hand wash Not microwave safe. Works best on items that are uniformly shaped (circles, squares) and do not have exaggerated sides (rectangular baking dishes). Small: Fits up to 3"
Medium: Fits up to 5"
Large: Fits up to 7"
X-Large: Fits up to 12"
Despite the negative reviews, I must reassure you that it is super easy to clean, and dry by hand. A thin dish towel works well to push up into it for drying . Moisten your fingertips when detachment from itself. When stretching over a small bowl I just brace the bowl against myself as I stretch the cover. Very economical and helps with decreasing our plastic footprint. 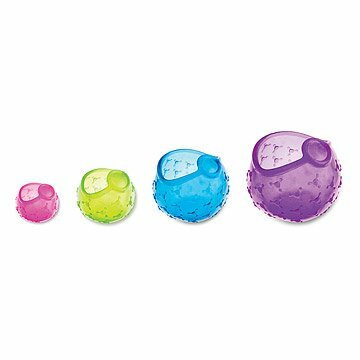 I love these things, but before I even got the chance to use them much, my son ruined them by putting them in our dishwasher. I will definitely be purchasing these again... like, right now. Product looks and feels great. I used one on a cut onion which turned moldy. The mold adhered to the cover and could not be rinsed off in any way. I even soaked in bleach but no success. I will have to throw it out. These products are great, they stretch over whatever you need to cover and the different sizes make it easy to find the perfect fit. My only issue is that the material is a little sticky (as in it sticks to itself) but that's easy to overlook and I would definitely recommend! The reviewers giving these a bad rap clearly didn't take the 3 seconds to look at the description, and see that it specifically meant for single items like fruits and veggies, NOT ENTIRE PLATES/BOWLS. Of course you had difficulty trying to stretch a lemon cover over a plate, it's not meant to do that! Don't be dumb, these work wonderfully for their INTENDED use. I have always felt guilty about how much plastic wrap I use for 1/2 an onion, apples, etc as I put them in the fridge. This product cuts down on that. Wonderful idea and the fun colors brighten up my white kitchen! I bought these at another's recommendation. While they do a good job of keeping food fresh, I found them difficult to stretch over a bowl or plate. They are probably better for use covering individual foods, such as melons or cukes, but I haven't tried that. Food got all over my hands as I tried covering things, so I decided they just aren't for me. We aren't sure, as we like the idea of reusing these. They stick to themselves and are hard to clean and get dry. We were going to give as a gift, but when we tried them, we decided not to. Multiple sizes fit almost anything. Keeps fruits and veggies fresh. Saves from using plastic wrap or foil. Just make sure your husband knows not to put them in the dishwasher. It will ruin them.